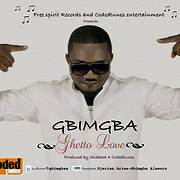 Alawuru Djerien (Gbimgba) is a new name to many, but he has already amassed a strong following of supporters and fans. As many new artists today, Gbimgba first found success behind the scenes, through codedtunes, what else needs to be said, if you don’t know the name by now you must be sleeping on a bicycle. Over the past year, Going by the previous name on coededtunes Lord of Ajasa, 9ice, Olamide etc the Warri native began working with producer Idcabasa.